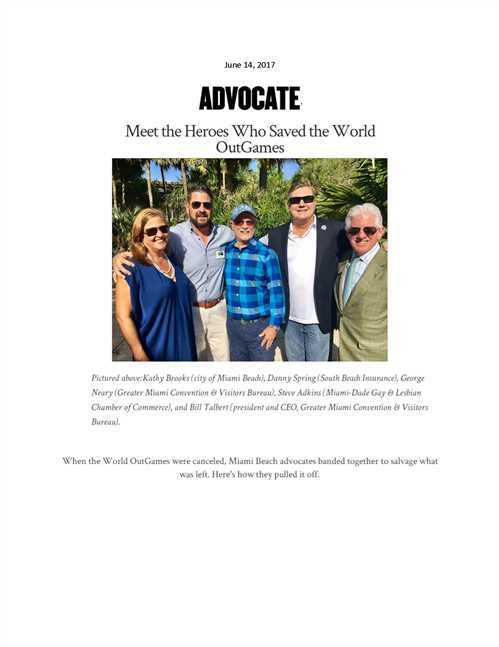 The Greater Miami Convention and Visitors Bureau (GMCVB) has an entire PR department dedicated to growing Miami and the Beache as a world-class, gay-friendly destination. The GMCVB’s annual LGBTQ press trip aligns with one-of-a-kind events such as The White Party, Pride, and – in 2017 – the OutGames. A challenge to keep the story fresh for the media, the OutGames provided new international media appeal. With athletes and media converging on Miami, in the days leading up to the competition OutGames coordinators unexpectedly announced that the games were cancelled. The GMCVB had to act quickly, strategically and in lockstep with local organizers to ensure that the OutGames were salvaged and that the destination’s message was one of support for the LGBTQ community. The GMCVB seized the opportunity to move forward with the planned LGBTQ press trip – and the resulting story in The Advocate was even better than the team could have hoped for. The GMCVB is a longtime supporter of LGBTQ tourism and local communities, and is helping grow Miami and the Beaches into a world-class, gay-friendly destination.